The following column was written as commentary for the June 2017 episode of the Beyond Boston monthly video news digest — produced by the Boston Institute for Nonprofit Journalism and several area public access television stations. It’s aimed at suburbanites, but fun for the whole Boston area family. There are many merits to backing legislation, regulations, and customs that make it easier for people to use bicycles to get around. Improving individual health by getting more people more exercise, improving public health and global warming prospects by reducing carbon emissions, and relieving traffic congestion to name just a few. And over the last four decades, many communities have created bike lanes and bike paths, installed bike racks, and limited certain streets to pedestrians and bikes for those very reasons. The problem is that the societal benefits that come with an expanding bike culture are unevenly distributed. In the car-centered suburbs — meaning most of the US — using a bike as a primary transportation mode is more difficult and significantly more dangerous than it is in many cities. And the distances people have to pedal to get to jobs or shop are longer — stopping more people from getting out of their cars and onto bikes day to day. Ameliorating that situation will require better regional planning with an eye toward creating bigger, better public transportation networks that link to bicycle infrastructure in their “last mile.” Then building bike lanes from the network hubs where buses, trains, and trolleys converge. Out to the neighborhoods where people live. It will also require a change in thinking by millions of people who are used to jumping into their cars anytime they need to go anywhere. Be it 100 miles or, all too often, only a few blocks away. Such a change means that people will need a pretty big incentive to begin to do things differently. So here’s one important incentive: life is easier when you don’t have to rely on a car to get around. In cities like Boston, more and more people are riding their bikes to subway stops or bus stops in the morning, parking them there, taking the T to work, and reversing those steps in the evening. Many others ride their bikes all the way to work — moving much faster on average than the cars stuck in traffic around them. Still more use our growing rental bike system, Hubway. From my perspective, living and working in the city spares me the expense of a car. And, more importantly, I don’t need to own one to get around. I live a couple of blocks from four bus lines, and a 10-minute walk from two T stops. With a bike, that 10 minutes plus any wait time becomes two or three minutes. And skipping the T and biking across town takes 20 to 30 minutes. Even in busy traffic. When it’s time to shop, one can either use a bike equipped with a basket or trailer. Or take a bus or train both ways. Or walk or bike to the nearest market and take a cab back, if buying heavy stuff. Or take a cab both ways. Or use a car sharing service like Zipcar to rent cars and vans by the hour. Myself and fellow urbanites have all these options, and more, because Boston, Cambridge, Somerville, and Brookline all have dense public transportation networks — augmented by quasi-public and private transit options. And a fast-growing separate bicycle infrastructure. Businesses and public services cluster around transportation hubs; so there’s much more for me to do much closer to home than when I lived in the suburbs. In general, this means that I have more leisure time in the city than many people in the suburbs do because I’m commuting less — and I have more money in my pocket because I don’t have to own a car to get around. I’m also not sitting in traffic for big chunks of my day — so my life is that much less stressful (understanding that every form of transportation has its own problems). Best of all, I can take comfort in the fact that my “carbon footprint” is very small. The amount of carbon that’s burned in the form of oil and natural gas to allow me to be a modern person in an advanced industrial society is much lower than someone who has to own a car. True, housing prices are higher in the city than the ’burbs, but the difference is definitely offset by cheaper transportation costs. And having more free time is invaluable. My point here is simple. More folks need to get behind policies that make an urban multimodal transportation network possible for the vast majority of US residents — instead of just a minority of Americans in mostly coastal cities. That’s going to require large numbers of people to be more aware that life with bikes and public transit is easier and better in some important respects than life in the current suburban car culture. And that’s why I’m recounting my daily transportation experience here. 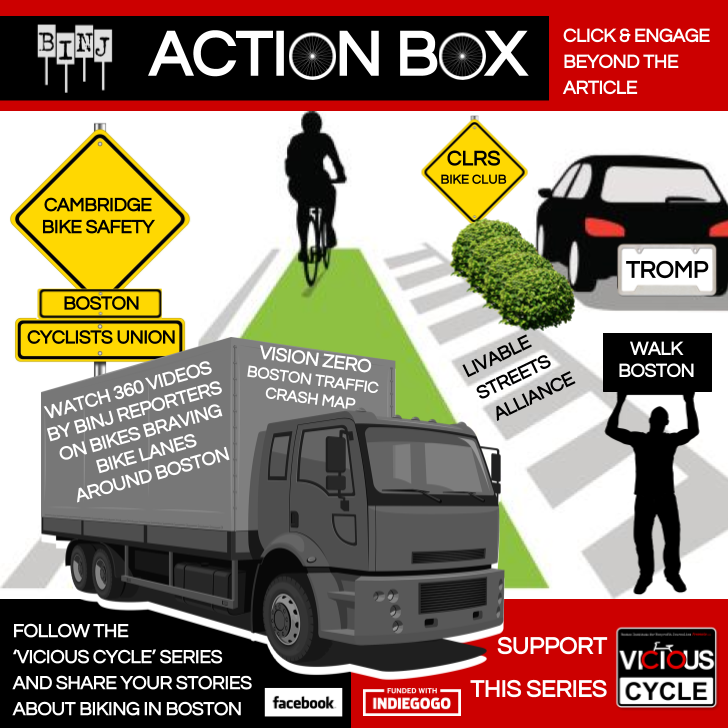 So that you all think it over, and consider joining advocacy coalitions like MassBike in backing policies that improve transportation options in your city or town. And then help fight for more money to vastly expand our public transportation system. Two reforms which will, in tandem, transform suburban biking from a recreational activity, sport, or idiosyncratic form of commuting into a commonplace. Three weeks into their strike, Harvard University dining hall workers are in a difficult position. Their union’s demands for better wages, benefits, and working conditions are falling on deaf ears in the Harvard administration. They cannot continue picketing indefinitely on $200 weekly strike pay—which itself won’t last for long … and the bosses know it. That same administration talks about the situation as if the workers are already overpaid since they make wages higher than the industry standard. Even though college food service workers generally get low pay with few benefits by convention. It tries to make the Harvard dining hall workers union, UNITE HERE Local 26, look greedy by asking for more, when all the workers want is a living wage to be able to survive the increasingly insane costs of living in Greater Boston. And a health care package that doesn’t raise their out-of-pocket costs. Which other Harvard unions have already agreed to, sadly. Endowment gifts are intended by their donors to benefit both current and future generations of students and scholars. As a result, Harvard is obligated to preserve the purchasing power of these gifts by spending only a small fraction of their value each year. Spending significantly more than that over time, for whatever reason, would privilege the present over the future in a manner inconsistent with an endowment’s fundamental purpose of maintaining intergenerational equity. A statement worthy of a CEO or banker. Or neoliberal ideologue. Basically saying, We can’t spend more money from the endowment because we don’t want to touch our principal and lower our profits. Funny attitude for a supposed nonprofit. One that’s unfortunately being emulated at colleges around the country as the privatization of higher education continues apace. Since Harvard is unwilling to spend down its endowment by even a tiny percentage to ensure all its employees receive truly fair wages and benefits, it’s all the more imperative that dining hall workers continue to press their demands. And that more people support them. Because not only is Harvard screwing its own food service staff while amassing wealth beyond the dreams of avarice, it is also doing grievous damage to the Massachusetts public higher education system. Which raises the stakes considerably. And links the problems of one group of working people to the fortunes of the working families of an entire state. For whom shaking the edifice of Harvard’s endowment must become a central political concern. Understanding Harvard’s finances is the key to apprehending why the university’s very existence is problematic in a democracy—and a clear and present danger to the state public higher education system. And to answering the central question: Why is an institution of higher learning allowed to run like a multinational corporation? Socking away funds that it possesses mainly because it educates the children of the one percent—scions of powerful families who steal money from the rest of us in myriad ways and then donate part of that money back to the supposedly nonprofit school in exchange for income tax breaks. A school not required to pay taxes on its vast income by dint of that nonprofit status. Which then also takes huge amounts of public funds despite being a private school. It’s also worth asking why Harvard is not a public college. Why is it not UMass Cambridge? Harvard was, after all, originally part of Massachusetts state (and colonial) government. Yet over the centuries it was able to reorganize itself as a private nonprofit school, and essentially write the rules it plays by. But for a “private” school it’s certainly awash in public money. A brief review of how Harvard enthusiastically drains government coffers that it refuses to replenish should make it painfully obvious that it is indeed a public university. And therefore in dire need of democratic reform to better align its mission with the needs of the Mass public higher ed system. First, all the funds in the Harvard endowment, and all the money it makes from financial investments, is not taxed. Neither is all the property Harvard owns—on which it famously expends small “Payments in Lieu of Taxes” (PiLoTs) instead of much higher property taxes. According to Slate, a report by Nexus Research and Policy Center—a right-wing pro-corporate think tank that I would normally avoid citing—does some sloppy math that nevertheless helps us think more clearly about the magnitude of the problem with giving private schools nonprofit status. The report says that, in 2014, Harvard made the equivalent of $48,000 in tax savings from federal, state, and local governments for each of its students. Many of whom can definitely afford to pay full freight on their education. While predominantly working and middle class Massachusetts public college students are educated in woefully underfunded state institutions. The Nexus report indicates that UMass Amherst—the Commonwealth’s flagship university— made only the equivalent of $9,900 in tax savings for each of its students. While undergraduate tuition and fees amounted to $13,258, and average room and board costs were $10,957, for a total cost of $24,485 that year. Even before thousands in book costs and other fees are considered. Second, although it may not be obvious to outsiders, many Harvard students use public grants and loans to get through school. According to its website, the annual disbursement from the Harvard endowment covered 35 percent of the university’s $4.5 billion operating budget in 2015—including much of the cost of tuition and fees for undergraduate students who need it. And the Harvard administration makes clear that “Even with endowment support, Harvard must fund nearly two-thirds of its operating expenses … from other sources, such as federal and non-federal research grants, student tuition and fees, and gifts from alumni, parents, and friends.” But a good chunk of the aforementioned tuition and fees is covered with public money. It’s true that Harvard pays all expenses for the 20 percent of current undergrads who come from families that make less than $65,000 a year. One cheer for that given the provenance of Harvard’s money. However, undergrads whose families make between $65,000 and $150,000 a year are expected to contribute up to 10 percent of the total cost of their education annually. And undergrads whose families make more than $150,000 a year pay concomitantly higher percentages of their education costs. Students whose families can’t cover those costs, and don’t receive enough scholarships, grants, or stipends from private sources can apply for federal and state financial aid like any other college student(though foreign undergrads generally don’t qualify for such aid). Graduate students lean more heavily on public support. Harvard financial aid is similar to other universities in its expectation that its grad students—especially the cash cow master’s degree students—will apply for federal and state financial aid for any expenses they can’t pay out of pocket. Its PhD students get a supposedly free ride, as elsewhere, but the stipends the school pays for their labor as teaching and research assistants clearly aren’t much better than anywhere else given that they are now trying to emulate their peers at public universities by organizing a labor union. Certainly not enough to live on for many students. So public grants and loans are used to fill gaps in funding. Harvard made its estimated federal grant and loan totals available online for the 2011-2012 academic year. Its students received $10,257,035 in federal grants, $8,371,891 in Perkins Loans, and $135,249,758 in federal direct loans. A tidy sum to be sure. Third, and perhaps most damningly, Harvard gets a ton of direct federal appropriations every year. To cite just one significant example, in 2014, Harvard had about 20,000 students and received $572,918,000 in federal research and development money according to the National Science Foundation. About $28,646 per student, although it’s obviously not distributed that way. Critics may respond “no harm, no foul” since Harvard gets lots of public R&D money because they do lots of R&D. But that gets things backwards. Harvard does lots of R&D because it has long gotten lots of public R&D money—which should be used to fund public universities to do the work instead. With more public oversight in the public interest. That same year, the UMass system had almost 74,000 students and received $362,157,000 in research and development money from the federal government. However, the Massachusetts public higher education system also includes nine state universities and 15 community colleges. Both additional groups of colleges receiving only negligible federal research and development funds as teaching colleges rather than research colleges. So the government money UMass gets for R&D covers all of the 194,371 students in the combined public higher education system in the Bay State in the period in question. Amounting to a mere $1,863 per student. Or about $4,894 per student looking at just the UMass system. Such hoarding must be stopped. More to the point, the private university system has to be dismantled if the dream of free higher education for all is to be guaranteed. An attainable dream other countries with far less wealth than ours have been able to manage for decades. One which could be achieved by simply taxing the rich and corporations fairly on the state and federal level to pay for such social goods. An even taller order than the policies under discussion here. For now, if you really want to help the Harvard dining hall workers and much of the population of Massachusetts in the bargain, help start political movements to demand structural reform of the state university system—and ultimately the national higher ed system in its entirety. As an interim measure, such movements can push our state government to seize the endowments of so-called private colleges like Harvard and absorb all of their campuses into the public higher education system. Which will end the Commonwealth’s higher ed crisis by flooding the system with once-hoarded money. Guaranteeing a decent college education to more Mass residents while eliminating bastions of privilege and power in our midst. And naturally, a well-funded public higher ed system would have the means to pay its workforce properly and a tradition of “wall-to-wall” unionization that would leave no campus workers unprotected. Solving the problems of the Harvard dining hall strikers, and all other previously low-paid workers at every campus in the Commonwealth. The parting shot? In 2015, the entire Massachusetts budget for public higher education was $1,462,827,301. Well below the $1.6 billion disbursement from the Harvard endowment for operating expenses that same year. Meanwhile, the 2017 Mass higher ed budget is only $1,157,298,156. With worse cuts on the horizon. TUES., OCT. 25, 2016 UPDATE: Early this morning, the Harvard Crimson reported that a tentative agreement has been reached by the striking dining hall workers and the Harvard administration. The full membership of the UNITE HERE Local 26 dining hall workers unit is slated to vote on the agreement tomorrow (Wed., Oct. 26, 2016), and could be back to work as early as Thursday, Oct. 27, 2016.